Aunt Becky has given Jennifer books, pictures and correspondence from Jeannette Rankin over a 30 plus year period. One touching letter to �Becky and Connie� was written by Miss Rankin from Carmel, CA, just a couple of days before her death. 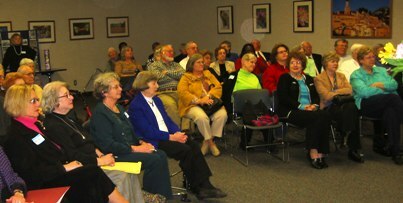 A good crowd attended the kickoff of the Jeannette Rankin Celebration month of programs starting at the Oconee County Library on Sunday, March 7, 2009. Jennifer Dawson, a native and graduate of OCHS in 1989, presented her collection of Rankin memorabilia collected over 25 years. 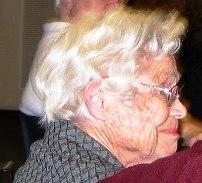 Much of it dealt with the years Ms. Rankin lived in her seasonal home at Shady Grove, near Butler’s Crossing in Oconee County. Several persons who knew Miss Rankin were in attendance. Jennifer teaches AP Sixth Grade Social Studies at Lost Mountain Middle School in Kennesaw, Cobb County, Georgia. Jennifer has received several recognitions in her teaching career. 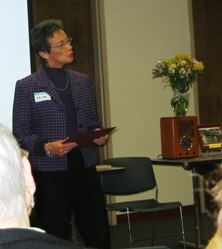 She has also made the presentation on Jeannette Rankin on other occasions. 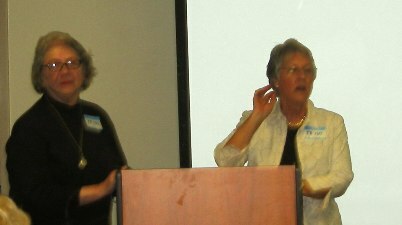 Attendees included the Founding Mothers of the Jeannette Rankin Foundation: Reita Rivers, Heather Kleiner, Margaret Holt, Sue Bailey & Gail Dendy. Former Vice President of AFB&T, Bucky Redwine, Jane Vandiver Kidd and Clarke County Probate Judge Susan Tate were in attendance along with many others from Athens-Clarke County and Oconee County and Georgia. The oldest persons in attendance who knew Ms. Rankin were Rebecca Dawson Barnette (Aunt Becky) and Mavis Nunnally Allgood.Ms Allgood knew Ms. Rankin in the 1920’s at her home in Bogart, Clarke County.Ms. Allgood described the Bogart Home including its accidental destruction by fire. She also said she met Carl Sandburg and Susan B. Anthony at the Rankin Home. Aunt Becky was recognized by her great niece, Jennifer Dawson, for the collection of memorabilia from her long friendship with Jeannette Rankin. Aunt Becky has given Jennifer books, pictures and correspondence from Jeannette Rankin over a 30 plus year period. One touching letter to “Becky and Connie” was written by Miss Rankin from Carmel, CA, just a couple of days before her death in 1972. 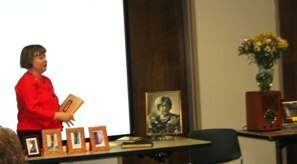 Jennifer Dawson also described a book she wrote for elementary students on the life and career of Jeannette Rankin. 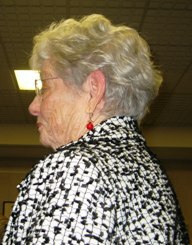 Much of the information came from local persons, books on Miss Rankin and the Montana Historical Museum in Helena, Montana.Dawson explained that she would teach her Sixth Grade AP Social Studies students a lesson on Miss Rankin and her time in History as the first U S Congresswoman. Others have been inspired to write about her from that exposure. At the end of the program, Oconee Commission Chair Melvin Davis read a Proclamation recognizing the Month of March in Oconee County for celebrating the Life and Legacy of Jeannette Rankin. 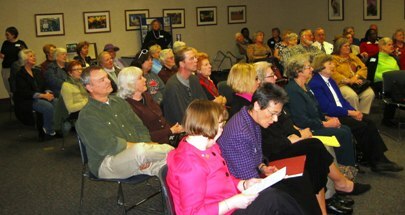 Refreshments were served and many stayed around to view the exhibit items and to talk to persons in attendance. The Oconee Connection to a person of national historic significance was interesting to view and hear about. 7-3-09 Aunt Becky turned 90 on June 17 and is sprinting toward 95 & 100!